These days, it’s nearly impossible to disentangle politics and current events from any discussion concerning China. Sure enough, recent news reports about the challenges confronting U.S.-China relations – and the overall state of global affairs – served as topics of conversation for IU delegation members during an all-day series of meetings and other activities in Beijing on Thursday. This, in itself, was not at all surprising. Given the dominant headlines of the day, it’s truly a remarkable time to be in China (just as it was almost surreal to be in Seoul several days ago as the leaders of North and South Korea prepared for their historic inter-Korean summit meeting in Pyongyang). Outside of Tsinghua University Art Museum. More noteworthy – at least to this humble traveling correspondent – is how much our conversations today underscored the vital importance of university engagement in international affairs. Indeed, politics didn’t preclude members of the IU delegation – and the Chinese leaders in arts and culture, education, finance and government with whom they met today – from emphasizing the ever-critical nature of internationally focused institutions like IU enhancing their global outreach. These efforts prepare students to live and work in a complex and interconnected world, gain greater global competencies and cultural understanding, and meet the most pressing challenges facing the planet. McRobbie, IU Vice President for International Affairs Hannah Buxbaum and their IU colleagues began their Thursday morning at the Chinese Academy of Social Sciences, China’s premier academic organization and comprehensive research center in the fields of philosophy and the social sciences. 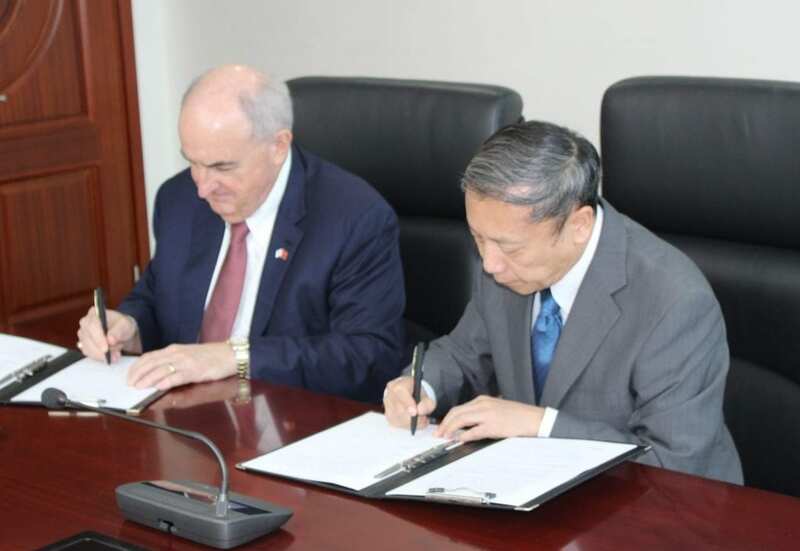 IU President Michael A. McRobbie, left, and Cai Fang, vice president of the Chinese Academy for Social Sciences, sign the first-ever agreement of friendship and cooperation between their respective institutions. Setting the stage for today’s meeting, a delegation of eight IU faculty members and administrators from IU’s Bloomington and Indianapolis campuses arrived at CASS in the spring to explore the potential for joint student and faculty exchanges. 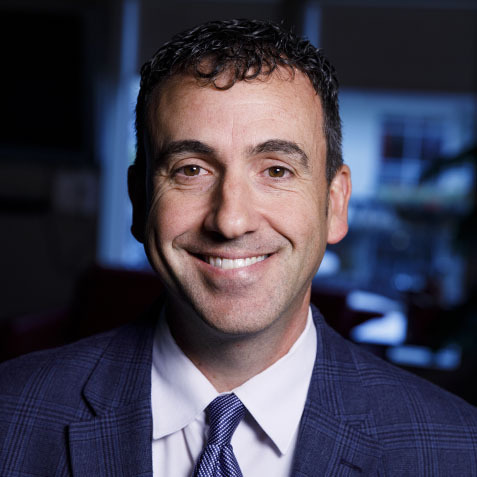 The delegation was led by IU Associate Vice President for International Affairs Gil Latz, with Ethan Michelson, associate professor in sociology and law and the academic co-director for the IU China Gateway office, also providing key direction. Michelson has lived and conducted research in China for almost eight years. For their part – and stemming from their own visit to Indiana in 2017 – CASS faculty and staff have expressed an interest in learning more about economic, policy and socioeconomic issues in Indiana and, more broadly, the Midwest – a region of our nation that, more than any other, has undergone considerable political change in recent years. As President McRobbie indicated, this change has not been studied and understood as well as other developments on the east and west coasts of the U.S., which may lead to other interesting opportunities for collaboration with CASS. 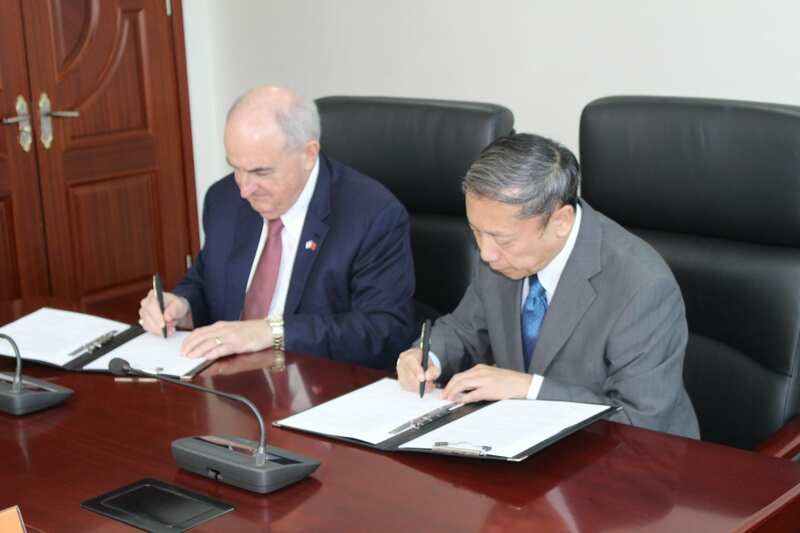 After a lively discussion, McRobbie and CASS Vice President Cai Fang signed the first-ever agreement of friendship and cooperation between their respective institutions. The agreement calls for continued discussions involving senior leaders from IU’s College of Arts and Sciences, School of Global and International Studies and School of Public and Environmental Affairs. 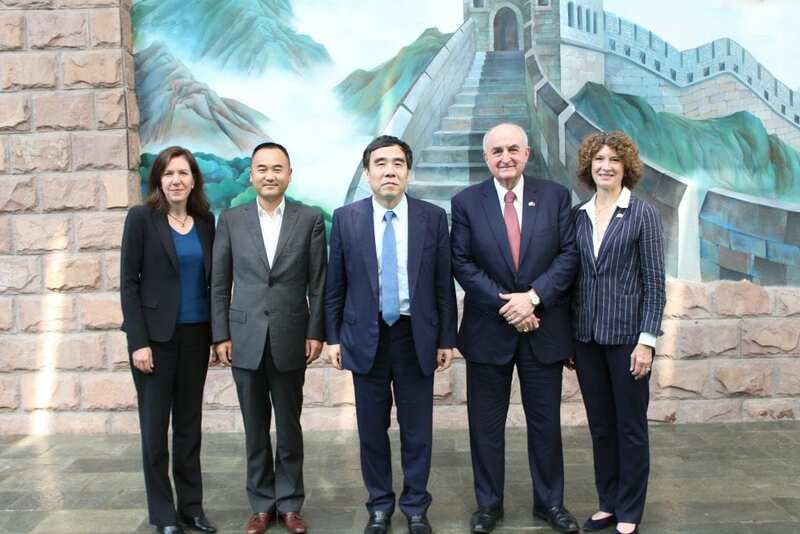 Following the agreement-signing at CASS, President McRobbie and his fellow delegation members met with Tian Guoli, chairman of the China Construction Bank. CCB is one of the “big four” banks in China, the second-largest bank in the world by market capitalization and the sixth-largest company in the world. The bank has more than 13,500 domestic branches and institutions in 30 countries around the world. While at CCB, McRobbie and Guoli engaged in a lively discussion, during which Guoli described the major issues facing China’s economy and McRobbie discussed the enormous contributions IU’s students from China – and countries from every corner of the world – have made to enhancing the educational environment on IU’s campuses across Indiana. IU has more than 8,000 international students. Of that number, more than 3,100 students are from China, making it the leading country of origin for international students at the university. McRobbie also talked about the great goodwill generated around the globe – for Indiana and its flagship public university – by IU’s more than 7,000 alumni affiliated with China, many of whom have gone on to become leaders across East Asia in academia, business and government. Members of the IU delegation met with Tian Guoli, chairman of the China Construction Bank, pictured at center. From CCB, it was on to a meeting at the Chinese Ministry of Education, which regulates all aspects of the educational system, including higher education. While there, McRobbie shared with Ministry Director General Xu Tao news of IU’s new partnership with CASS as well as the university’s overarching goal of expanding student and faculty exchanges with China and ensuring a continued welcoming environment for Chinese students and scholars on all of the university’s campuses. The number of Chinese scholars teaching and conducting research at IU, numbering roughly 500, continues to grow. Furthermore, as School of Global and International Studies Founding Dean Lee Feinstein shared at today’s meeting, there are some 500 IU students learning Chinese language at all levels of instruction, including some who are studying in China, an increasingly popular choice for overseas study. 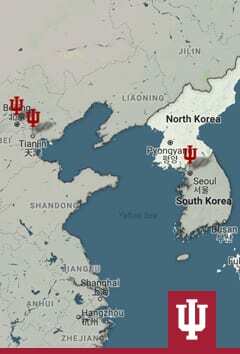 Indeed, China now ranks in the top 10 countries where IU students choose to study abroad, and it’s now the No. 1 study-abroad destination for students from the IUPUI campus. During the meeting, McRobbie nicely summed up IU’s philosophy behind its engagement in East Asia and other dynamic parts of the world. The exhibition celebrates the beginning of a multiyear partnership between the Sidney and Lois Eskenazi Museum of Art at IU and the Tsinghua University Art Museum, and it marks the first collaboration of its kind between university art museums in the U.S. and China. 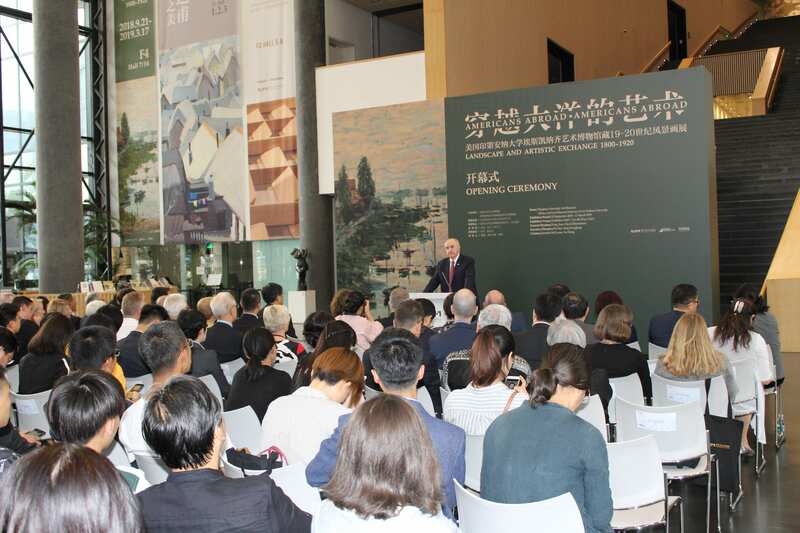 IU President Michael A. McRobbie speaks at the opening of the “Americans Abroad” exhibition, part of a new multiyear partnership between the Eskenazi Museum of Art at IU and the Tsinghua University Art Museum. The IU Eskenazi Museum of Art is currently undergoing an extensive renovation of its building, which was designed by renowned Chinese-American architect I.M. Pei, and is scheduled to reopen in the fall of 2019. 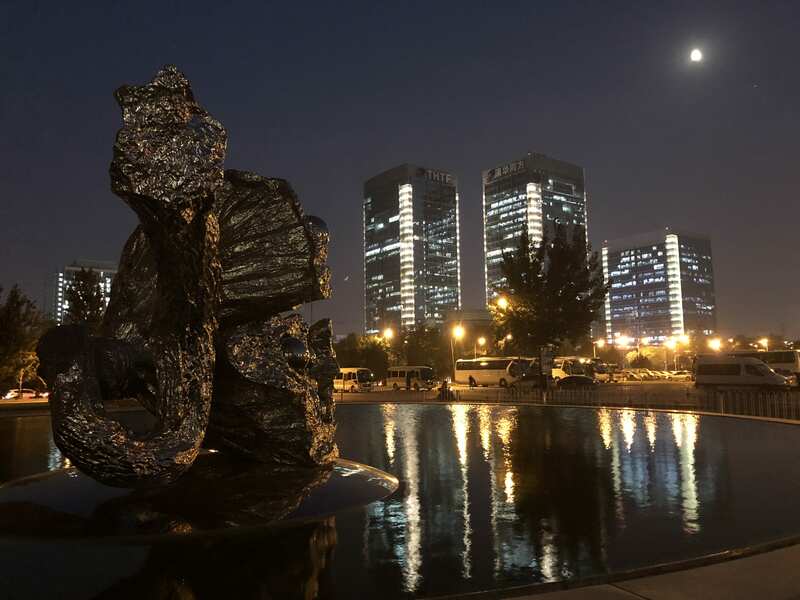 While that renovation is underway, IU is partnering with Tsinghua University Art Museum, which is part of one of China’s leading universities. Tsinghua will send its own exhibition of Chinese scroll paintings from its permanent collection to the Eskenazi Museum of Art once its renovation is complete. The “Americans Abroad” exhibition examines landscape painting as a means of international exchange, as well as how early American artists looked to Europe for cultural and artistic inspiration that would allow them to depict their own national landscape. It also explores the influence of travel, study abroad, expatriation in Europe and French Impressionism on the development of American art. Among its 50 featured paintings are important works by Claude Monet, Gustave Caillebotte, Jasper F. Cropsey, Maurice Brazil Pendergast and Winslow Homer. Thirty-eight of the paintings are from the Eskenazi Museum’s permanent collection, and 12 are on loan from the IU Campus Art Collection, the Indianapolis Museum of Art at Newfields and the Terra Foundation for American Art in Chicago. In that spirit, the opening of this extraordinary exhibition offered an enlightening and inspiring end to a busy day in Beijing, one in which we celebrated progress, new partners and the promise of greater IU engagement here in East Asia in the months and years ahead.